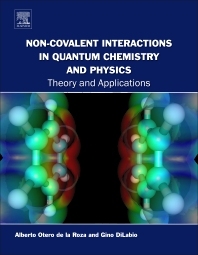 Non-covalent Interactions in Quantum Chemistry and Physics: Theory and Applications provides an entry point for newcomers and a standard reference for researchers publishing in the area of non-covalent interactions. Written by the leading experts in this field, the book enables experienced researchers to keep up with the most recent developments, emerging methods, and relevant applications. The book gives a comprehensive, in-depth overview of the available quantum-chemistry methods for intermolecular interactions and details the most relevant fields of application for those techniques. Theory and applications are put side-by-side, which allows the reader to gauge the strengths and weaknesses of different computational techniques. Chemistry and physics researchers at advanced undergraduate, graduate, and researcher level in both industry and academia that are interested in the computational modelling of processes involving intermolecular interactions. Also, researchers in related fields that use density-functional theory to study processes of chemical, biological, and technological relevance. Dr. Alberto Otero de la Roza received his Ph.D. from the University of Oviedo (Spain) in 2011 and has since been working on developing and applying quantum chemical methods to the calculation of non-covalent interactions in chemical systems. With a record of recent activity in the field (30 articles on the topic, including one comprehensive review), Dr. Otero de la Roza is an expert in the development and application of computational methods for non-covalent interactions. Professor Gino A. DiLabio has been the Head of the Department of Chemistry at the Okanagan Campus of the University of British Columbia since 2014. Prior to joining UBC, he spent a decade at the National Institute for Nanotechnology (Canada) as a senior research scientist and most recently as an associate director. He has guided the development of the dispersion-correcting potential approach to improving the ability of density-functional theory (DFT) to predict non-covalent interactions. Of his more than 120 papers, ca. 40 of them have been on the development and application of dispersion-corrected DFT and one book chapter on the topic. He also has a patent based on the non-covalent interactions in asphaltenic species.